Resource list of Military Charities, Organizations and Government Contacts. Disclaimer: For informational purposes only. We cannot guarantee the validity of any of these websites or services. This post lists a variety of resource programs to help military families for the holidays. Membership provides discounts on various services such as car rentals. AFHSC performs comprehensive medical surveillance and reporting of rates of diseases and injuries among DoD service members. The Combat Wounded Coalition’s mission is to optimize the potential of combat-wounded warriors by mitigating the effects of trauma, expanding personal capabilities, and inspiring our heroes to find individual, unique purpose to create the life they want. Mission objectives are achieved through programs and opportunities that improve confidence, provide networking and direction, and offer balance and tranquility. We partner and provide connections to organizations which offer excellent resources, programs and proven strategies for success. Another CWC mission is to provide clothing modifications and a unique line of apparel available only to Purple Heart recipients and families of the fallen. We also honor families of the fallen with opportunities to participate in events with our heroes. Made up exclusively of men and women disabled in our nation’s defense, the Disabled American Veterans is dedicated to one, single purpose — building better lives for the nation’s disabled veterans and their families. IAVA is the leading post-9/11 veteran empowerment organization (VEO) with the most diverse and rapidly growing membership in America. We don’t just support veterans, we empower them! The Wounded Warrior Assistance Act is the first legislative action taken to address a host of problems encountered by outpatients at Walter Reed Army Medical Center. Veteran CareGiver was developed squarely in response to expressed challenges by Wounded Warrior and Veteran families, and Veterans Affairs leadership. ​signed into law May 5, 2010. The law provides support services to family and other caregivers of veterans including: education sessions for improved caregiving, counseling and mental health services, respite care, healthcare and a stipend for caregivers living with severely wounded veterans of Iraq and Afghanistan. As your financial advocate, NFCC member agencies provide financial reviews and education to millions of consumers each year. With office locations in all 50 states and Puerto Rico, NFCC members can provide you with comprehensive money management services based on your individual needs. The purpose of this web site is to present information about the services that the Vocational Rehabilitation and Employment (VR&E) program provides to veterans with service-connected disabilities. Seeks to connect corporate America with the rich skills and abilities of military veterans. Our purpose is to promote best practices and success strategies by which America’s military service members, upon their exit from active duty, are welcomed into America’s corporate workforce. Vocational Employment Counseling Center for veterans with spinal-cord injuries. For more information, call the PVA Veterans Benefits Department at 800-424-8200. Provides voc rehab and employment services for Americans with disabilities. To provide a training farm with an adjacent clinic, assist soldiers and veterans to transition, to find purpose and meaning in life and enable them to learn valuable vocational skills to meet the demand for agricultural ownership, employment, or other advanced schooling.Facilitate healing for those in need and place those trained on working farms. Vet Biz is a Veteran Resource Information web site designed to assist veteran entrepreneurs who want to start and expand their businesses in the Federal and private marketplace. VAMBOA is your non-profit veteran business trade association that promotes and assists Veteran Business Owners, Service Disabled Veteran Owned Businesses (SDVOB) and Military Business Owners. Our mission is to help veterans reintegrate back into society through the use of our Beginning Farmer fellowship program. While working together in a relaxed, open environment veterans will work as a team to develop solutions that will enable them to overcome physical and mental barriers.. Through our training fellowship program veterans will learn the skills and gain the education they need to start their own local farm or to work for larger farming organizations. Part of the Mark Cuban Foundation, it was established to help families of U.S. soldiers killed or severely wounded in Operation Iraqi Freedom. Donates “comfort homes,” built on the grounds of major military and VA medical centers. These homes enable family members to be close to a loved one at the most stressful times – during the hospitalization for an unexpected illness, disease, or injury. Includes a house in Landstuhl, Germany. This program enables family of wounded vets to stay near their loved ones while they are rehabilitating from spinal cord injuries, brain injuries or blast injuries. Financial need must be shown. Provides resources for deployed servicemen and their families such as educational grants for military spouses. A non-profit organization devoted to providing a college education to every child who has lost a parent while serving in Army, Navy, Air Force and Marine Corps Special Operations during an operational or training mission. Provides information and resources to military parents who have a child with special needs. Serving the children of our fallen military heroes. A resource for those grieving the death of a loved one who served in the military. Supports families with military relatives who are recovering from Post-Traumatic Stress Disorder. The VFW National Home for Children serves as a living memorial to America’s veterans by helping our nation’s military and veteran families during difficult times. Was established to help families of U.S. military personnel who were killed or seriously injured during Operation Iraqi Freedom. HONORING THEIR SACRIFICE, EDUCATING THEIR LEGACY. nearly nine out of 10 do not qualify for federal scholarship assistance. children of America’s fallen and wounded soldiers. National Transplant Assistance Fund works with the families and friends of spinal cord injured people to help them fundraise for future medical expenses. Funds raised are sent to NTAF and held for that SCI patient. Bills are then paid directly to vendors for things like adapted vans, home modifications, home care and medical bills. The person with SCI must have a social network that is willing to do the fundraising for them. Gives grants to families of injured or killed veterans of the Global War on Terrorism. provides emergency financial and other assistance to the families of our service members and wounded warriors. Provides financial assistance and quality of life solutions to marines and sailors injured in combat, training, or with life threatening illness. Can help with associate expenses including purchasing of special equipment, adaptive vans or vehicles, and handicap home purchases and modification. Provides financial assistance to OEF OIF service members and veterans for financial assistance to pay mortgages and utilities. The Independence Fund was founded in August 2007 with a mission statement of providing our veterans injured in the Global War on Terror with the tools, therapies, and guidance that they otherwise may not be receiving. USA Cares exists to help bear the burdens of service by providing post-9/11 military families with financial and advocacy support in their time of need. Polytrauma care is for Veterans and returning Service members with injuries to more than one physical region or organ system, one of which may be life threatening, and which results in physical, cognitive, psychological, or psychosocial impairments and functional disability. See FAQs and locations of Polytrauma Centers. Locate one of the 1,600 VA centers and facilities in the U.S. The program is designed to cut across bureaucratic lines and reach into the private sector as necessary to identify services needed for seriously wounded and ill service members, veterans and their families. To provide compassionate, highly-trained nurses to serve the health care needs of the nation’s veterans, the Department of Veterans Affairs (VA) is establishing new partnerships with seven of the country’s finest nursing schools. The partnerships will bring to 10 the number of collaborations between the Department and nursing schools under the VA Nursing Academy. President Bush has signed into law the Post-9/11 Veterans Educational Assistance Act of 2008. *Use applicable access code before dialing toll free number. For soldiers injured in Iraq & Afghanistan. Program will follow service member to get them find resources. is the repository of millions of military personnel, health, and medical records of discharged and deceased veterans of all services during the 20th century. National Resource Directory: An Online Partnership for Wounded, Ill and Injured Service Members, Veterans, Their Families and Those Who Support Them. The NRD was produced by a partnership between the Departments of Defense, Labor, and Veterans Affairs. This program assist veterans in adapting their homes for a disability that occurred serving in Iraq or Afghanistan at little or no cost for the veteran. The DV Farm will be based at a privately owned homestead belonging to former homeless veteran, DV6. Operated by vets for vets, the DV Farm will provide practical rehab for homeless veterans via a combined program of housing & meals, animal care, a structured work schedule and the camaraderie of fellow vets working together to reintegrate back into civilian life. Virginia Housing Development Authority is making grants for home modifications available to Virginia servicemen and women injured while serving the country. A program Sears Holdings has created in partnership with Rebuilding Together in response to an urgent need to assist military families facing hardship. Rebuilding Together, the nation’s largest all volunteer home rehabilitation organization, is committed to bringing warmth, safety and accessibility to homeowners who do not have the financial or physical resources to complete home repairs and other necessary improvements. Their mission is to build specially adapted homes for our severely disabled soldiers and their families. ​Military Warriors Support Foundation is a 501(c)(3) non-profit charity, founded by LTG. Leroy Sisco, (Ret), in 2007. Our Mission is to provide support for our nation’s combat wounded heroes and Gold Star Families as they transition out of the military and into their new civilian life. This is a very fragile time for these heroes, and their families, and it is our goal to provide programs that facilitate a smooth and successful transition. Our programs include home donation, academic and employment assistance, as well as recreational activities. Please note that PVA helps disabled veterans with funding for housing modifications. You must call them before doing any modifications. They pick the contractor and pay the contractor directly. They will not reimburse you if you choose your own contractor and then try to submit a bill to them. Battle In Distress shall work to be the missing link that connects Veterans and currently serving members of the United States Armed Forces who are in or at risk for being in mental, emotional, financial, or psychological distress to the individuals, organizations, government entities, or other entities that provide services or assistance that can ameliorate the underlying problems that lead them to a state of distress. Battle In Distress will serve as a vehicle for bringing about a national, cultural and societal change in the manner in which the matters of Stress, Resilience, Connection, PTSD, Suicide and other related issues affecting Service Members and Veterans are viewed, discussed, and addressed with regards to the best practices for caring for those that have served or are currently serving. Warrior Pointe’s Mission is to create the rallying point for warfighter’s past and present. Whether you served during peacetime or are currently serving in any branch of the service, you are welcome in the ranks of Warrior Pointe. Our goal is to reach all past or present warfighters who served or are serving this great nation honorably. These hero’s in their own right join our ranks to help raise awareness of the issues we face as the defenders of our nation. Change and the resolution of challenges from service to the nation is brought about through standing together with fellow warfighter. The Adaptive Sports Foundation (ASF) is a non-profit organization that provides profound and life changing experiences for children and adults with physical and cognitive disabilities and chronic illnesses through outdoor physical activity, education, support and community. AMVETS National Service Foundation provides support to veterans through service programs as well as providing community and youth-oriented programs designed to promote unity and patriotism. It counsels and represents veterans and their dependents before the Veterans Administration without charge. To help warriors relax, rehabilitate and reintegrate through kayak fishing and the outdoors. Call them to find a therapeutic riding program that offers a Horses for Heroes program near you. Every day, 22 veterans lose their battle on American soil to PTSD by Suicide. Do something to help prevent another life being lost by participating in the SAVE A WARRIOR CHALLENGE for suicide prevention. Register for free and order your SAVE A WARRIOR Shirt for $22 and we will give you the tools to help raise funds online to share with your friends and family. Or register your gym and become an ambassador to start the monthly challenge. Old Glory Honor Flight is dedicated to transporting our local WWII and Korean War veterans to Washington, D.C. to see the memorials built in their honor. Operation Enduring Warrior is a 501(c)(3) nonprofit organization whose mission is to honor, empower and motivate America’s wounded military service members. Our physical, mental and emotional rehabilitative cycle is modeled to overcome adversity and hardship through innovation, teamwork and perseverance; ultimately enabling Wounded Warriors’ lives to go in directions they once thought impossible. To help control symptoms of PTSD for our warfighter community through Music and Making Music. A non-profit organization that offers vacation accommodations for those vets who received a Purple Heart while serving in Afghanistan or Iraq. To support the needs and promote the welfare of United States Military service-members, their families, and all others whose service to public safety generally place the welfare of others before their own. The Military Veteran Project is a volunteer-driven charity committed to funding the most promising research to find cures for Post Traumatic Stress Disorder and Traumatic Brain Injury to assist with suicide prevention for PRE & POST 9/11 Veterans. Providing highly trained psychiatric and mobility service dogs to veterans of all eras suffering from Post-Traumatic Stress, Traumatic Brain Injury, and physical limitations at no cost. Connecting Veterans to employment opportunities within our network of Veteran-focused organizations. Building a community of peer support for Veterans and their families through programs, events, and social media. Our mission to place rescued American Staffordshire Terrier’s, Staffordshire Terrier’s, American Pit Bulls, American Bullies, English Bulldogs, and other Molosser Breeds, then rehabilitate and train them as Companion, and Service Dogs for fellow Veterans who are suffering with Post Traumatic Stress Disorder (PTSD), Traumatic Brain Injuries (TBI) and Military Sexual Trauma (MST). As a Combat Veteran Myself who suffers from PTSD, I understand the effects PTSD can have on everyday life and how PTSD affects relationships with family, and friends. It is our honor to rehabilitate, train, and place dogs with a well deserving Veteran suffering from PTSD. We strive to place quality trained dogs with our Veteran’s. We do not accept dogs into the program without thorough temperament testing. Dogs that fail the temperament training will not continue as a candidate in the program to ensure safety of the Veterans, family, friends, and the general public. Puppies Behind Bars trains inmates to raise puppies to become service dogs for the disabled and explosive detection canines The Dog Tags: Service Dogs for Those Who’ve Served Us program was established by Puppies Behind Bars to provide service dogs to veterans returning home from Iraq (OIF) and Afghanistan (OEF) who have suffered a physical injury, traumatic brain injury (TBI) or exhibit Post Traumatic Stress Disorder (PTSD). 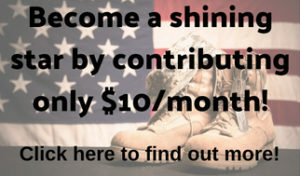 The Boot Campaign mission is to promote patriotism for America and our military community; raise awareness of the unique challenges service members face during and post-service; and provide assistance to military personnel, past and present, and their families. Disasters are our business. Veterans are our passion. Team Rubicon unites the skills and experiences of military veterans with first responders to rapidly deploy emergency response teams. ​The USO strengthens America’s military service members by keeping them connected to family, home and country, throughout their service to the nation. #22ADAY Movement for Military Suicide Awareness Everyday, 22 veterans lose their battle to post traumatic stress on American soil. That is 1 veterans every 65 minutes. It is time for us to take a stand by creating A #22ADAY movement in your community today. The Veterans Crisis Line connects Veterans in crisis and their families and friends with qualified, caring Department of Veterans Affairs responders through a confidential toll-free hotline, online chat, or text. Veterans and their loved ones can call 1-800-273-8255 and Press 1, chat online, or send a text message to 838255 to receive confidential support 24 hours a day, 7 days a week, 365 days a year. Support for deaf and hard of hearing individuals is available. Helps military families visit their wounded family members while they receive medical care. Priority is given to those serving in Iraq and Afghanistan. Veterans Angel Flight (VAF) facilitates no-cost or reduced-rate patient travel services for needy veterans and their families. Fund assists service members injured while serving in the United States Armed Forces. Special emphasis is placed on the “hidden signature injuries” of the wars in Iraq and Afghanistan – traumatic brain injury (TBI) and combat stress injuries including post- traumatic stress disorder (PTSD). The Green Beret Foundation provides direct and continuous support to the Green Beret Community and its families. The Green Beret Foundation facilitates the transition of Green Berets and their families whether that transition is from wounds sustained in combat, illness, injury or “merely” from numerous deployments and/or retirement. Operation Ward 57 supports wounded, injured and ill service members, veterans, their caregivers and those that aid in their recovery by providing assistance and outreach in their recovery, comfort and morale, and through advocacy, education and promotion of their circumstances. Did we miss one of your favorite organizations or charities? Contact us and we will do our best to get it added. Welcome to the Bedford Township Veterans Center! Bedford Township Veterans is a local non-profit outreach organization. We are the Bedford community organized to serve the needs of Bedford Veterans, Service Members and their families. Active, retired, reserve or guard you served us and Bedford serves Veterans. The Bedford Township Veterans Center is where to connect first. Located at the old post office in downtown Temperance we offer a wide range of services and a nice place to gather together and connect. Check regularly for events, participate in volunteer projects and please consider supporting financially. Individually we can only do so much but together we can support our own local Veterans and their families. The men and women who came to the aid of our nation when they were called upon, are a valuable resource to the country. If you want to build and enhance the dignity that all Veterans have earned by serving their country, the BTV Team encourages you to participate. Call today! Every American who has lived throughout our country’s existence has enjoyed a unique and lasting freedom. A freedom to live the lifestyle that any citizen would desire. To pursue riches, God, a family, to chase youth or wisdom, and possibly an education. If you are a Veteran or know someone who is a Veteran that lives in or is from the Bedford area, please share this online form to update your contact information with the Bedford Twp. Veterans team.